He still gets recognized. At the bar or at festivals, fans of a certain age will walk up to Pete Slosberg, almost in awe. They remember his face on advertisements for Wicked Ale, the beer from his discontinued brewery that bore his name for so many years. They have stories of drinking his beer, good times with friends, first dates, or how it was the brand that helped them onto the path of better beer. They shake his hand and ask for a picture. Inevitably, the people will ask what happened to Pete’s Wicked Ale, and if it’ll ever return. The answer to that first part is complicated. The second part now has a bit of good news attached to it. This morning, Slosberg mashed in at the Hoppin’ Frog Brewery in Akron, Ohio, with brewmaster Fred Karm to create Wicked Re-Pete 2X. “I discovered muscles that haven’t been used in a couple of years,” Slosberg said in a telephone conversation from the brewery. The beer is an imperial American nut brown ale, double in nearly every way from Pete’s Wicked Ale, the original American brown ale. To be clear, this isn’t a return of the Wicked brand or Pete’s Brewing Co. The brewery was sold to The Gambrinus Company in 1998 and has since left shelves. This is a collaboration beer between two brewing friends, and an homage to a beer that influenced so many and would have celebrated its 30th anniversary this year. Karm first met Slosberg in 2003. He was a brewer at Ohio’s Thirsty Dog Brewing Co. and Slosberg was visiting a nearby chocolate company, working on recipes for his company Cocoa Pete’s Chocolate Adventures. The road to this collaboration began with a charity event. Karm was working with the local chapter of the American Cancer Society and raffled off a brew day at the brewery to the highest bidder. The winning group was all over the spectrum with the style they wanted to create, and they eventually settled on a strong nut brown. For inspiration, Karm called Slosberg to inquire about the original Pete’s and the two got to talking about recipe development and ingredients. 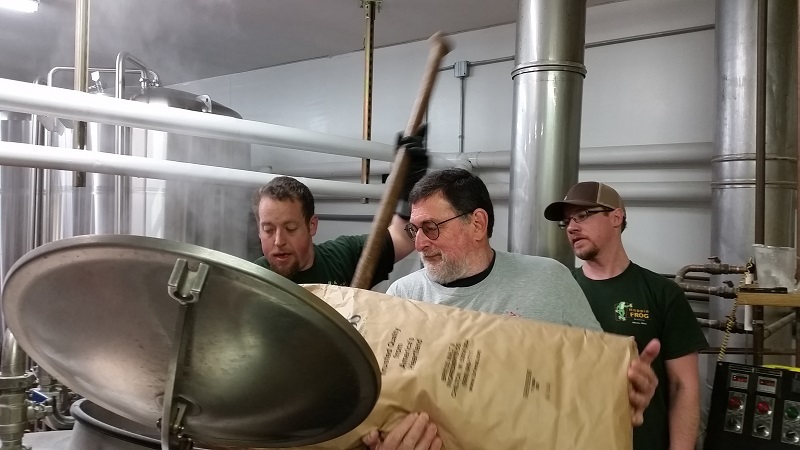 As they talked, Slosberg mentioned that he always wanted to make a stronger version on Wicked Ale, and by the time the call ended, the two had decided to brew a new recipe together. Wicked Re-Pete 2X will be 10.4%, and uses Brewer’s Gold and Cascade hops. They made about 20 barrels of the beer and it will be packaged in 22-ounce bottles (the label will feature Millie, Slosberg’s dog that adorned the original packaging) and on draft. It should be available by mid-May in select markets served by Hoppin’ Frog. Absolutely pray that happens!! One of my all time favorites! Come on Pete….bring it back!!! Bring back the Winter Brew! My favorite beer ever. I was crushed when I heard it was discontinued. I agree with the 2 guys above. Pete’s Wicked Winter was my favorite beer as a young twenty something. In fact, the reason why I am commenting is becasue I just was reminiscing on that beer and wondered what happened to the company. How about throwing out a anniversary batch of that available for online purchase or something. Nothing was better than an ice cold REALLY CAP ALE or STRAWBERRY BLONDE on a hot day! Not a fan of fruity beers but loved Pete’ Strawberry !! Loved Pete’s Wicked Honey Wheat! How I miss Pete’s Wicked! Living near Palo Alto only makes the loss even worse! lol! If you’d bring back Pete’s, I find it hard to believe it wouldn’t be incredibly popular and…..even more importantly……there to fill a hole left from this IPA craze that’s provided us with so few similar to that enjoyable easy drinking brown ale of yesteryear! I think that the absolutely best drinking brews of all time was Pete’s Wicked Summer Brew! Hands down the best. I remember the sampler 12 packs that had all of the beers mentioned, and how we by we I mean my then girlfriends sisters boyfriend Dan would playfully fight over our favorites since I believe there were only 2 of each. I miss those days and Pete’s!!! Pete’s was my intro to better beers. I loved them all. If they make the RePete available in Georgia I will stock a whole room in my house. I miss the wicked and winter ales every time I walk into a craft brew shop.